Lessing was born in in Cape Town in 1971. According to Boulder Coaching, he had an early love of outdoor sports and by the end of his fifth year at school had won provincial honours in swimming, sailing and biathlon and was a successful cross-country runner. When Lessing was nine, his family moved to Durban. In the 1980s in apartheid ruled South Africa, Lessing rebelled against the status quo. One time he and a friend removed all the duplicate books from the storeroom of the school library and gave them to a nearby black school that had none. He also made sporting sacrifices; in 1987 he pulled out of a prestigious athletics meeting in protest for a black student who was not allowed to compete. As a talented athlete, Lessing was pressured to take up South Africa’s No.1 sport, rugby, but stayed true to his other loves. At 14, his triathlete swim coach suggested he give a new sport a go. 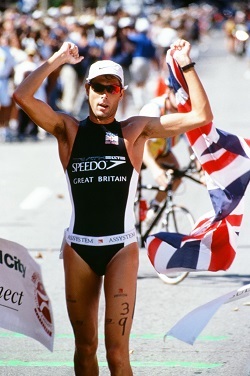 In 1988 Lessing was South African national champion, but after he finished high school he wanted to compete internationally, he made the decision to represent Great Britain, his mother’s home nation. At the time South Africa was banned from competing in all international sporting competitions due to apartheid. Of all of those memories, it’s the consistency across his career that he is most happy with. Greg Welch may be small in stature but his depth of athleticism was immeasurable. With a personality bigger than he was and an iron will to boot, Welch etched his name in the history books. Read up on his career. ITU's very first male World Champion, Mark Allen's triathlon story is one of perseverance and triumph, speed and endurance, road blocks and redemption.